If you like one stop shopping and multi-purpose compact tractors in Hesketh Bank, then you will love our Redblade Mowers sales and service centre. At Redblade Mowers we carry a full range of top brand mowers and other lawn equipment and we service what we sell. 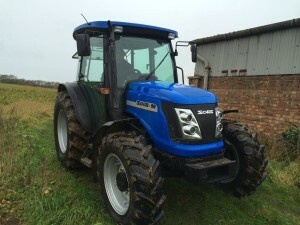 If a compact tractor for any sized property is what you need then we recommend Solis Tractors. These little powerhouses are great value for money. Choose from 20 hp to 90 hp and select your choice of a cab or platform with roll-over protection. You’ll find work for your Solis year round. When you buy your Solis from us at Redblade Mowers, we’ll help you assemble the most efficient setup of attachments to give you the most for your money. Solis tractors are built tough to get the job done and so are the attachments. In Hesketh Bank, compact tractors, attachments and accessories are backed up with a guarantee. One little machine will cut the grass, plough the snow, spread the manure, haul the trailers, dig the trench, split the logs, till the soil, transport the hay bail and help the kids learn to drive. Some of them are even street legal. These are strong machines with unbeatable pulling power for HP and they are easy on fuel use. Solis compact tractors are strong and durable to handle the work of a dozen different machines. That is an excellent investment in equipment for small farms, large estates, landscaping suppliers and anybody who has a lot of grass to cut, snow to plough and stuff to haul. Redblade Mowers sells Solis compact tractors in Hesketh Bank with confidence. We know the brand is proven reliable. They are also low maintenance and fuel efficient. We service what we sell and if you ever need spare parts, they are readily available and affordable. Contact Redblade Mowers or come by our showroom and let us show you our Solis compact tractors. We can help you choose the right size and the attachments that will help you get your work done. These little tractors will make you glad you bought that big property. Financing is available.